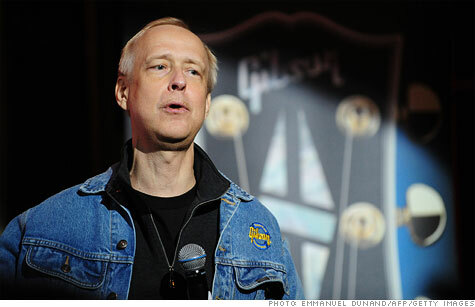 NEW YORK (CNNMoney) -- Gibson Guitar CEO Henry Juszkiewicz is fuming. As he sees it, his company, the iconic maker of the Les Paul and Firebird X electronic guitars, is being unjustly attacked by the federal government. On Aug. 24, armed agents from the U.S. Fish and Wildlife Service raided two of Gibson's Tennessee production facilities and its Nashville headquarters. "It was a nightmare," said Juszkiewicz. "We had people sitting there making guitars. We had no weapons." Given that the company was already dealing with the government on an earlier investigation, he said the feds should have worked with the company to make sure its procedures were in compliance. The company has always made a good-faith effort to follow the law, he said. But now Juszkiewicz isn't feeling so cooperative. The latest raid revolves around a trade issue. The wood was allegedly exported illegally because it was unfinished and too thick to be a veneer, the only unfinished wood India allows to be shipped, according to a Justice Department affidavit. Why the U.S. government would enforce an Indian trade law can be explained by century-old legislation called the Lacey Act, which mandates that American companies observe the laws of foreign countries in the trade of many animal parts, plants and their products, including wood, which was added to the act three years ago. However, Juszkiewicz insists the wood is legal under Indian law because it's a finished product -- a fingerboard that gets attached to the neck of the guitar. He said he has letters from the Indian government to prove it. The company hasn't been charged with wrongdoing, but Juszkiewicz said he was told that if the company sells or ships any of the Indian wood or finished guitars containing the material, it could be charged with additional violations of the Lacey Act and also with obstruction of justice. As a result, his entire operation could effectively be shut down, he said. The Justice Department said it couldn't comment on the ongoing investigation. 0:00 / 3:16 Is your Gibson guitar contraband? If Gibson were to shut down its Tennessee factories, it would put more than 700 people out of work. And Juszkiewicz will have none of that. He's keeping the factories running and told the Justice Department he will take personal responsibility for any legal liability. If anyone is arrested, he said, it will be him. "We have not been able to make some products, but I'm not going to lay people off," he said. Juszkiewicz is eager to prove his case in court, but he isn't optimistic he'll get the opportunity. "The problem is, we have no recourse," he said. "These guys have investigated us for two years. They came in twice and shut the place down." The company is still awaiting judgment on the earlier case, which involves rare wood from Madagascar confiscated from Gibson's factories in 2009. Meanwhile, Juszkiewicz hasn't been able to get the wood or some of the guitars that were confiscated returned. Since the company hasn't made much headway in the courts, it has taken its case to the masses. Juszkiewicz and his company have rallied a virtual army on the web by encouraging people on Facebook and Twitter to write their representatives and demand action. The company even launched a Twitter campaign under the hashtag #ThisWillNotStand. "Why is big government spending our money to harm ordinary citizens and small businesses?" Juszkiewicz tweeted last Friday. Guitar enthusiasts are angry because not only is production of the famed guitars now in question, but under the Lacey Act, anyone owning or selling one of Gibson's guitars could also be arrested for obstruction of justice. For its part, the Justice Department said that in such cases it generally only pursues retailers or manufacturers that knowingly engage in the sales of a substantial number of instruments -- not individuals. Perhaps unwittingly, Gibson has also garnered the support of Tea Party activists and political conservatives who see the raid as evidence that the Obama administration is killing American jobs. Juszkiewicz said he doesn't think the raid was about politics, however. He just remains puzzled -- and frustrated -- about the whole ordeal. "It doesn't even make sense politically," he said. "Gibson believes it is innocent of any wrongdoing. We will fight aggressively to prove our innocence."